What would you do if you needed some money? Would you pick some of a tree in the garden? 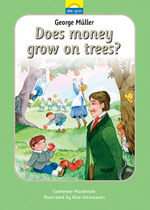 Of course you wouldn't - because money doesn't grow on trees. You have to work for it. Sometimes you have to work hard. George Müller didn't like to work and tried to get his money in other ways. He would cheat and steal and was eventually thrown in prison. Find out how God changed George from a thief to someone even children could trust. Full-colour illustrations on every page.